February 2019 - Hamilton School District. 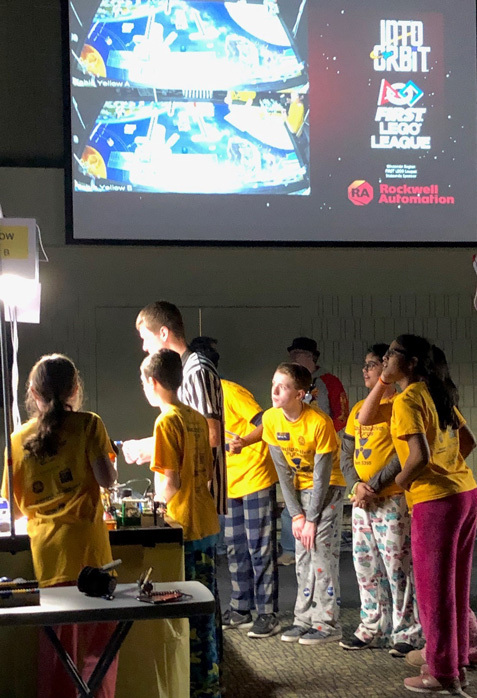 Templeton Middle School had its best year ever in FIRST LEGO League (FLL) competition, with two of its teams qualifying for state competition – one of them earning a state award. 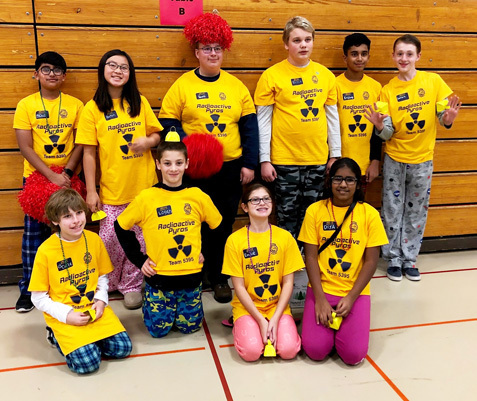 Members of the Radioactive Pyros and Bullistic Bulldogs were among 36 teams statewide that competed Feb. 23 in the Wisconsin FLL Championship. The Radioactive Pyros won the Project Research Award and were nominated for the Project Presentation Award. The statewide award is the first in Templeton history. 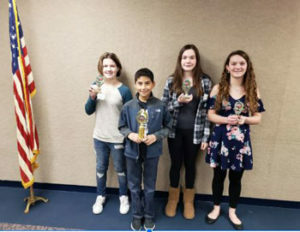 Previous to the state competition, Templeton’s three teams – the Radioactive Pyros, Bullistic Bulldogs and Templebotz – competed in regional and sectional tournaments. Templebotz was nominated for the Robot Mechanical Design and Teamwork Awards. Bullistic Bulldogs won the Project Research Award and was nominated for the Project Innovative Solution Award. FLL challenges kids to think like scientists and engineers. This year, teams chose and solved problems related to long duration space explorations. Templebotz chose to solve back muscle deterioration in microgravity. Bullistic Bulldogs wanted to overcome the problem of humans generating enough oxygen to survive in space. Radioactive Pyros attempted to solve the problem of astronauts not getting quality sleep due to noise and an unbalanced biological clock. In addition to the problems, the teams also built, tested and programmed an autonomous robot to solve a set of missions in the Robot Game. Throughout their experience, teams are encouraged to operate under the FIRST core values that include celebrating discovery, teamwork and gracious professionalism. Kathy Betters, Kelly Mallinger, Dave Kaiser, Bill Haley, Matt Zank, Jason Fuhr, Deepak Babu, Dave Neuman, Beth Volden and Brian Nagai coach the Templeton Junior Robotics Program. The advisor is Kathy Betters. Students will participate in full band rehearsals and sectionals conducted by music educators from throughout the state during the day before the concert. Band students in grades 8-12 will lead team-building activities and mentor the younger students. Michael Sweeney, Hal Leonard band publications director, will serve as the guest conductor. 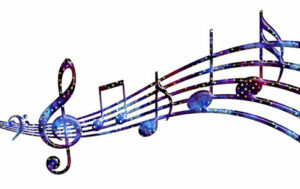 Sweeney has more than 500 published compositions or arrangements. 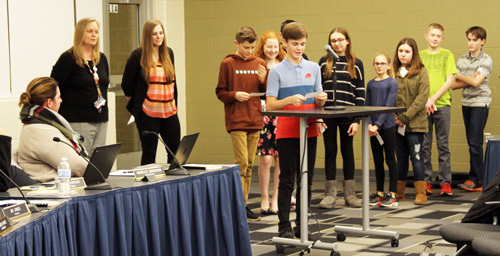 He composed all of the music to be performed at the festival including “Panther Rising,” commissioned specifically for the Hamilton Band Festival with support from the Hamilton Education Foundation. 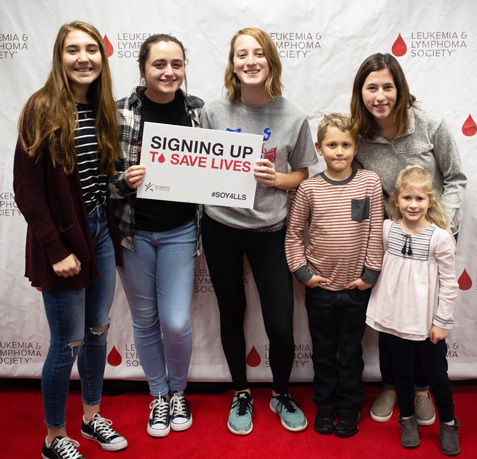 Hamilton High School Student Council and National Honor Society are getting behind a student’s campaign to help The Leukemia & Lymphoma Society (LLS). 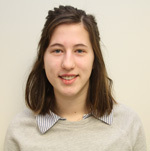 Hamilton senior Mikayla Cup is spearheading a seven-week fundraising challenge in hopes of becoming the 2019 LLS Student of the Year. The campaign supports LLS’s mission to find a cure for blood cancers and assist patients and families as battle the disease. Leukemia is the most common cancer in children, adolescents and young adults under the age of 20 years old. “One of my goals in this campaign is to generate awareness about the LLS and bring the community together through the support of the high school, local businesses and events,” Cup said. Student Council, National Honor Society (NHS), Club Action and Club Unique have supported the cause by selling cookies, brownies, flowers and locker decorations. NHS sponsored a “Put Cancer to Bed” pajama day Feb. 22 and raised $713. LLS is the world’s largest voluntary health agency dedicated to blood cancer that funds lifesaving blood cancer research around the world and provides free information and support services. Every dollar raised counts as one vote in the LLS Student of the Year challenge. The campaign ends March 7. 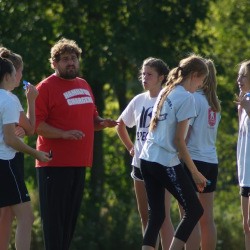 Hamilton High School Girls’ Rugby Head Coach and communication arts teacher Barry Holloway was named president of Wisconsin Girls’ Rugby (WGR). It is the organizing body for high school girls’ rugby in Wisconsin and dedicated to providing a positive, competitive and healthy rugby experience. 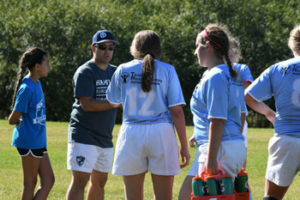 The association coordinates league competition and match schedules, organizes the annual state tournament and represents Wisconsin girls’ rugby at the Midwest and national levels. Holloway will lead the league into its 20th season with a focus on creating a strategic plan to grow rugby in the state. He is currently in his second year as head coach at Hamilton where he was instrumental in starting the team. During his tenure, the team has a 7-5 record, seven all-state players and finished third at state in 2018. Previously he coached the 2007-09 University of Wisconsin-Whitewater women’s team. Holloway played high school rugby at Waukesha West High School. For more information about Hamilton girls’ rugby club please visit https://hamiltonrfc.org/. Four Hamilton High School seniors have been named finalists in the National Merit Scholarship Competition. The students are Abigail Dowse, Molly Hubred, Ty Kozic and Jonathan Sciortino. High school students enter this competition by taking the Preliminary SAT (PSAT)/National Merit Scholarship qualifying test, which screens approximately 1.6 million entrants who are high school juniors. Of the 1.6 million entrants, some 50,000 with the highest PSAT scores in critical reading, math and writing skills qualify for recognition. About 16,000 high-scorers are notified that they have qualified as semifinalists. They are the highest-scoring entrants in each state. About 15,000 of these students go on to become finalists. The selection of some 7,500 Merit Scholarship winners from the group of finalists is now in progress and will be announced in March. USA Rugby and Premiership Rugby have selected Hamilton High School Girls’ Rugby Assistant Head Coach Victor Drover as recipient of its Premiership Rugby Scholarship. Drover was one of only 30 coaches in the country selected for the all-expenses paid week-long trip to England to study coaching with England’s Premiership teams, rugby’s equivalent to the National Football League. As a result of the intensive program to be held in March, Drover will earn Level-300 coaching certification which is held by only six coaches in the state and about 500 coaches nationwide. Coach Drover was on the inaugural staff when the Hamilton Rugby Football Club started two years ago and resides in the Hamilton School District. Hamilton High School communication arts teacher and Girls’ Rugby Head Coach Barry Holloway appreciates what he has already done for the team. Hamilton High School announced its first semester honor roll for the 2018-19 school year. To be named to the Dean’s List, a student must have a grade point average between 4.00 and 5.00. High honors is 3.50 to 3.999, and honors is 3.00 to 3.499 for the semester.